Plaque buildup in the carotid artery impeding blood flow to the brain (click on image to enlarge). Every year, more than 300,000 people in the U.S. are diagnosed with blockages in their carotid arteries, which can lead to a dangerous stroke. 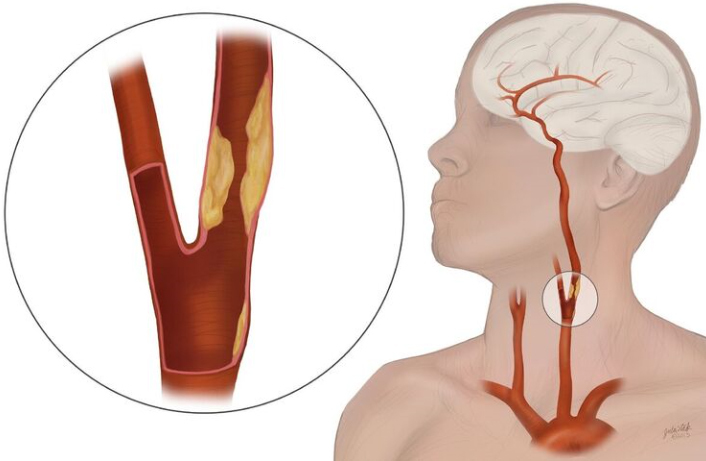 A potential complication of both surgery (carotid endarterectomy, or CEA) and stenting for stroke prevention in patients with carotid artery disease is a stroke occurring during the procedure itself. Studies have shown a higher risk of stroke during conventional stenting as compared to surgery. Now, there is a new, safer procedure to clear the carotid arteries. Leading the way in patient care in our region, our Vascular and Endovascular Surgery Division have treated the first patients on Long Island with the new minimally invasive transcarotid artery revascularization (TCAR) procedure. The TCAR procedure offers patients a safer method of carotid stenting through a small incision at the base of the neck and direct carotid artery access along with neuro-protective flow reversal during delivery of the stent. (l to r) Drs. Apostolos Tassiopoulos, Angela Kokkosis, and George Koullias. TCAR not only obviates the need to navigate catheters through the aortic arch (a step linked to stroke during carotid stenting through the groin), but also prevents fragments of plaque released during stenting from travelling with the bloodstream to the brain and causing small or bigger strokes. The first TCAR procedures at Stony Brook Medicine were performed by Apostolos K. Tassiopoulos, MD, professor of surgery and chief of vascular and endovascular surgery, Angela A. Kokkosis, MD, assistant professor of surgery, who is the division's director of carotid interventions, and George J. Koullias, MD, PhD, assistant professor surgery. Commenting on the surgery, Dr. Tassiopoulos says: "At the Stony Brook Vascular Center we treat all aspects of vascular disease frequently including high-risk patients that are turned away by other physicians and hospitals. "Offering this new minimally invasive treatment option for our patients with carotid artery blockage is advancing patient care here by dramatically reducing the risk of stroke and heart attack during and after carotid interventions. "In contrast to conventional carotid endarterectomy surgery, TCAR requires a smaller incision resulting in decreased risk for nerve damage and a faster recovery time. With its ingenious flow-reversal system, TCAR also has been shown to have fewer stroke complications compared to carotid stenting performed through the groin." TCAR uses a special transcarotid neuro-protection system (NPS), and is designed to reduce the risk of stroke during the insertion of the stent. The novel NPS device allows the surgeon to directly access the common carotid artery in the neck and initiate high-rate temporary blood flow reversal to protect the brain from stroke while delivering and implanting the stent. The TCAR procedure is performed through a small incision at the neckline just above the clavicle. This incision is much smaller than a typical CEA incision. The surgeon places a tube directly into the carotid artery and connects it to the NPS that directs blood flow away from the brain, to protect against plaque that may come loose reaching the brain. The patient's blood flows through the NPS and any material is captured in a filter outside the body. The filtered blood is then returned through a second tube in the patient's upper leg. After the stent is placed successfully, flow reversal is turned off and blood flow resumes in its normal direction. "This report presents the 30-day results of the Safety and Efficacy Study for Reverse Flow Used During Carotid Artery Stenting Procedure (ROADSTER) multicenter trial and evaluates the safety and efficacy of ENROUTE Transcarotid NPS (Silk Road Medical Inc, Sunnyvale, Calif), a novel transcarotid neuroprotection system that provides direct surgical common carotid access and cerebral embolic protection via high-rate flow reversal during carotid artery stenting (CAS). The results of the ROADSTER trial demonstrate that the use of the ENROUTE Transcarotid NPS is safe and effective at preventing stroke during CAS. The overall stroke rate of 1.4% is the lowest reported to date for any prospective, multicenter clinical trial of CAS." — Kwolek CJ, Jaff MR, Leal JI, et al. Results of the ROADSTER multicenter trial of transcarotid stenting with dynamic flow reversal. Journal of Vascular Surgery 2015;62:1227-34.